Home Unlabelled Kenyan woman carries placard in search of a husband- someone please marry her!!! 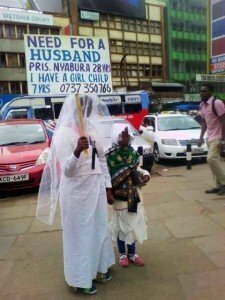 Kenyan woman carries placard in search of a husband- someone please marry her!!! Awwww... women are becoming more daring these days. A single mom in Kenya has broken the internet after a photo of her carrying a placard in search of a husband went viral. Need for a husband I have a girl child seven years 7 years old. She stood on a busy street with a veil covering her face and held out her placard unashamedly, while holding the hand of her little girl. With her number boldly written on that placard, Nyabura will most definitely receive lots of calls. Even though this seems a bit extreme, we hope she finds what she is looking for.